Carpet Pile Height of 0.375"
These 6 x 10 blue entry mats will keep flooring clean with their absorbent polypropylene fibers. The area rugs feature a decorative ridge pattern that's great for work stations or building lobbies. 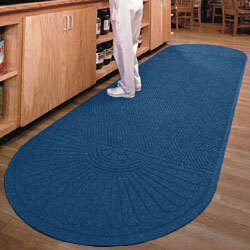 In addition, the blue entry mats are made to absorb water, dirt and mud and are easy to clean with a hose or vacuum cleaner. Each carpet is anti-static rated at 1.2KV by the AATCC and Certified Slip Resistant by the National Floor Safety Institute. 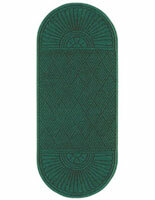 The decorative entry mats feature a bright shade but red, green, gray and area rugs are also available. The lobby flooring has a pile height of 0.375".